This post is part of a compensated campaign with Farmland® and Latina Bloggers Connect. All opinions and the recipe here are my own. Queso fundido potato skins are a sinful snack perfect for any party or game day. Or even a random Saturday when you just want a savory, meaty, cheesy snack. I usually serve queso fundido with tortillas (mostly corn tortillas, but sometimes flour) or hearty tortilla chips. 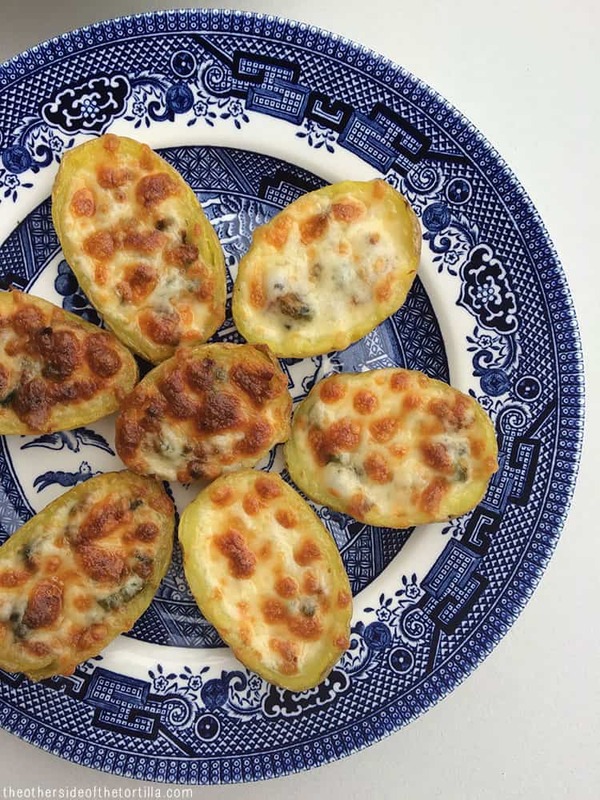 But I’ve had a penchant lately to meld together my Mexican favorites with my American favorites, which is what prompted me to create these queso fundido potato skins. As a kid, my grandma would sometimes take me for a day downtown together, where she’d take me to the art museum and we’d always go to lunch at a place nearby that had potato skins on the menu. You know the kind I’m talking about, loaded with cheddar cheese, big pieces of crumbled bacon, chives and a big dollop of sour cream. I always ordered the potato skins. I never even needed to know what else was on the menu. To this day, whenever I eat potato skins, I think of those fun afternoons out with my grandma. 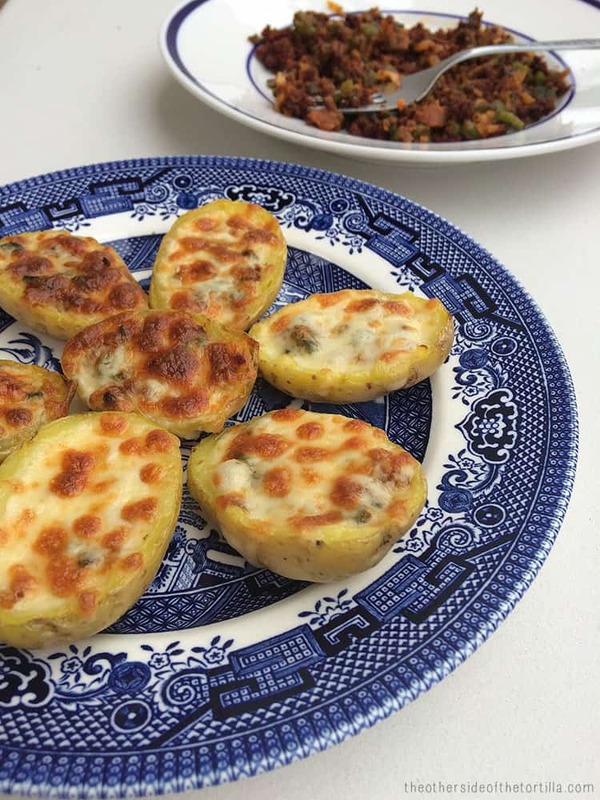 Because of my long-running love for potato skins, and my reputation for making the best queso fundido, I melded these two dishes into an extraordinarily delicious finger food. For the best taste, I like to use a thick cut bacon to make heartier bacon crumbles. Here, I’ve used Farmland® Extra Thick Cut Hickory Smoked Bacon which is slow smoked over real hardwoods. The bacon mixed with chorizo, onions and poblano chiles is divine, and if you have any leftovers, you can use it to mix into scrambled eggs or an omelette! Wash all the potatoes and dry them. With a fork, poke holes all the way around each potato. Put the potatoes in a microwavable dish and microwave on your normal setting for 5 to 6 minutes. Set aside and allow them to cool slightly. Roast the poblano chile on the stove, sweat and skin it. Dice into small pieces. Finely dice a few slices of white onion, until you have 1/4 cup. Cook the chorizo in a nonstick frying pan and then drain on a paper towel. Wipe the pan with a paper towel to remove the chorizo grease and then add the bacon and cook until crisp. In another pan, add 1 tablespoon of bacon grease, the diced onion and poblano chile. Over medium-low heat, stir well to incorporate for about one minute. Add chorizo and stir well again. Allow it to cook for about two minutes and then remove from heat. Cut each potato in half and scoop out the middle, so you have potato skins. Put them on a baking sheet lined with parchment paper or aluminum foil. 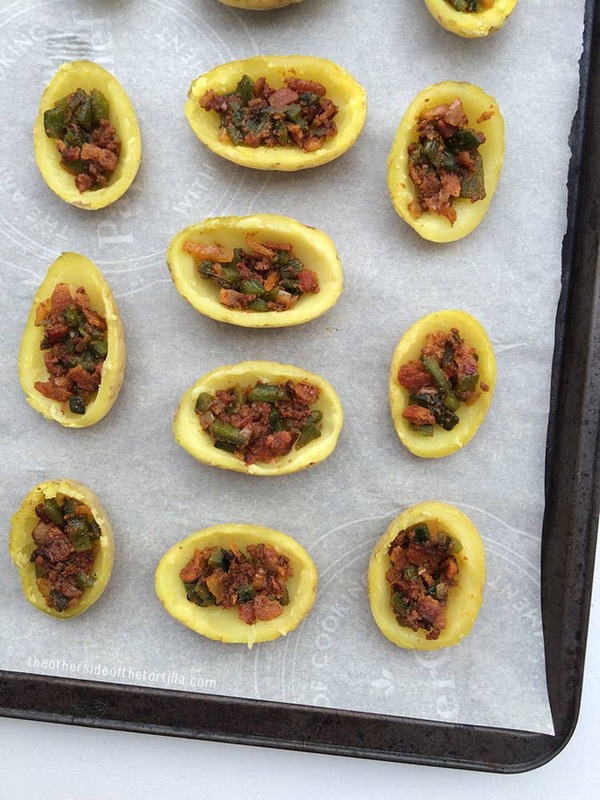 Spoon mixture into the bottom of each potato skin and then cover with cheese. Place baking sheet under the broiler for 5-7 minutes or until the cheese has melted and begins to bubble and turn slightly brown. Serve straight from the oven, or with optional garnish of crema mexicana and chopped chives. For more recipes with Farmland® pork products, visit farmlandfoods.com. This is a compensated collaboration with Farmland® and Latina Bloggers Connect. However, all opinions expressed are my own. These look SO yummy! I can just imagine the flavor! Thanks for sharing.